Protests in cities across the Iranian province of Khuzestan, Southwest of Iran have intensified. 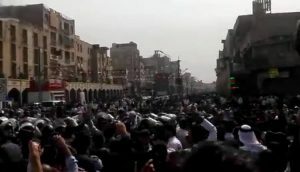 Just months after the country came together in mass anti-regime demonstrations against the Iranian regime, the people of Khuzestan are back in the streets due to severe government mismanagement. At the beginning of March, there were some small anti-regime protests near Isfahan. Farmers in the region had been affected by drought due to the mismanagement of water by the Iranian regime. 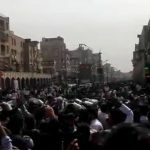 With discontent for the regime among the provincial population rising, the protests soon spread, with protestors from nearby Ahvaz, Kut Abdullah, Abadan, Mashahr, Shoush, Hamidiyeh and Sheyban taking to their streets in anti-government protests. On Thursday the 29th of March, police and anti-riot personnel attacked protestors in Kut Abdullah with tear gas and batons. In Ahvaz, they arrested protestors, including women. In Shoush, four workers from the Haft Tapeh Sugar Cane Complex were arrested for their involvement in protests. In fear of the growing protests, the Iranian regime is planning to clamp down on communications platforms available to the Iranians. The regime has plans to close the Telegram, Iran’s popular social media platform, by April 20th. The regime will replace the platform with a similar platform under the control of the regime. The move violates international treaties and is in direct contrast to the values of internet freedom upheld by the United Nations Security Council and the International Telecommunication Union. Telegram is essential for the Iranian population’s access to information. 80% of the Farsi-language information on the internet is sent via the social media platform. It also provides more than 200,000 jobs and contributes significantly to the Iranian economy. The closure further demonstrates the lack of interest from the Iranian regime at promoting a strong national economy. Maryam Rajavi, leader of the People’s Mujahedin of Iran (MEK), lamented Rouhani’s destruction of the Iranian economy the day before the protests in Khuzestan erupted. The country’s currency reached record lows against the US dollar in February of this year. The government crackdowns are becoming more forceful. Individual arrests are limiting Individual freedoms. Now, the collective freedom of the whole of Iran is in jeopardy with the loss of the Telegram as a space to share information. However, the protests in Khuzestan demonstrate the people’s will to rise up against the repressive regime is growing despite all repressive measures. While the possible Telegram’s shutdown demonstrates a regime scrambling to maintain control against an increasingly frustrated and determined population. As the appetite for regime change in Khuzestan is increasing, we stand with them and call on the International communities for solidarity to protect Iranian civil freedom and access to information on the internet and to take the human rights dossier of the Iranian regime to the United Nations.